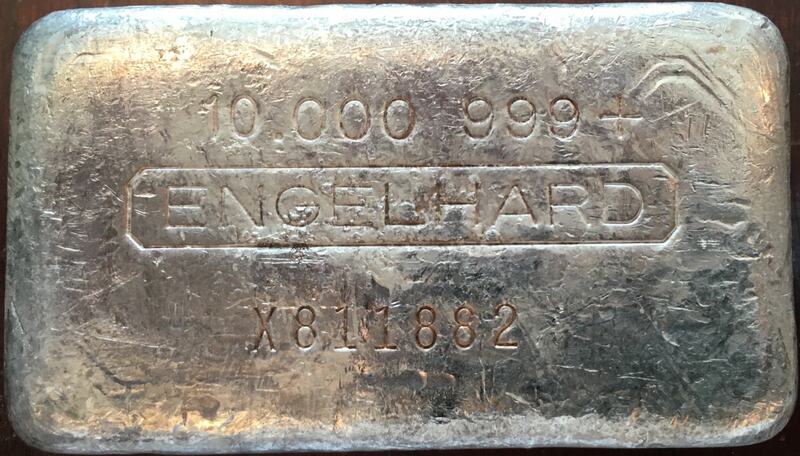 This page contains our current information on 10oz class Engelhard silver production bars and Legacy Ingots. 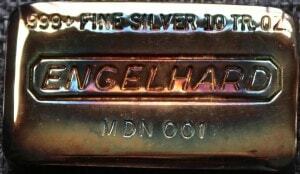 For many collectors and investors, the 10oz Engelhard bar represents the standard and preferred bullion choice. 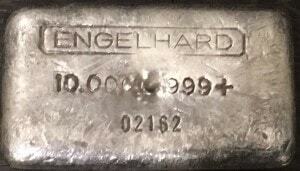 Engelhard 10oz bars are a comfortable size to handle and serve as an ideal store of value for investment and trade. 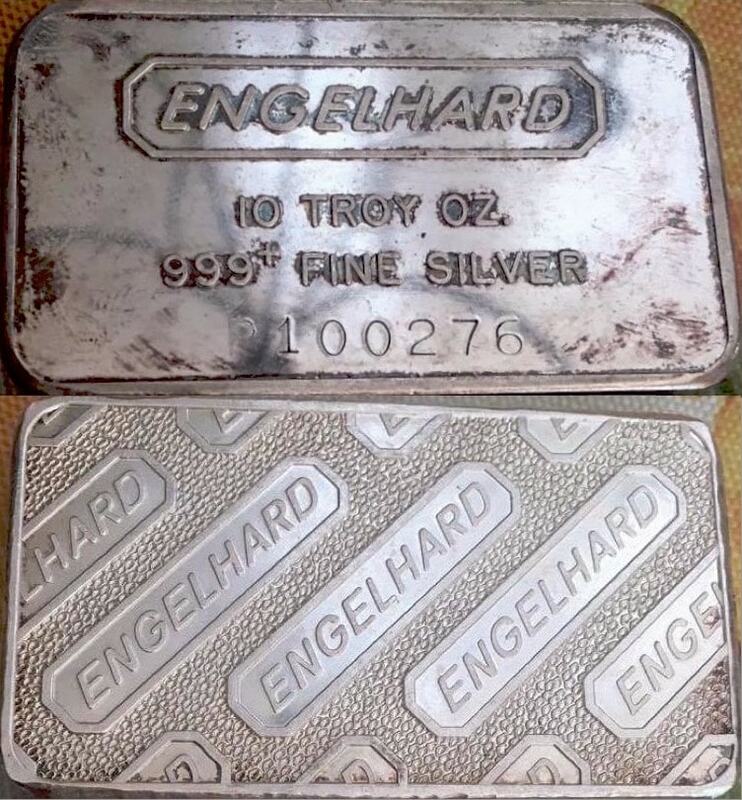 As with the smaller weight class Legacy Ingots, Engelhard 10oz ingot lineage witnessed many variations through early production years. 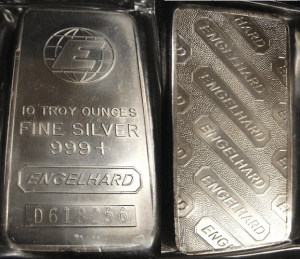 These variations include placement of hallmark, weight and purity stamping as well as frequently erratic and crude serial stamping. 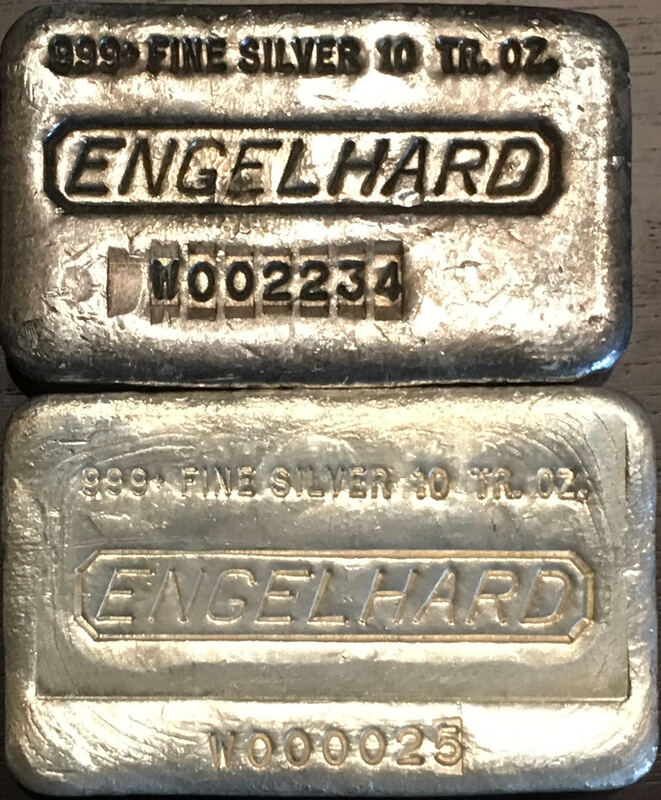 Amazingly, these ingots were generally considered junk bars and frequently melted until just a decade ago, when collectors began to appreciate their inherent beauty and undeniable scarcity. 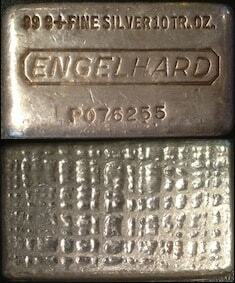 Engelhard 10oz Legacy Ingots are now among the most sought after on the collector front. 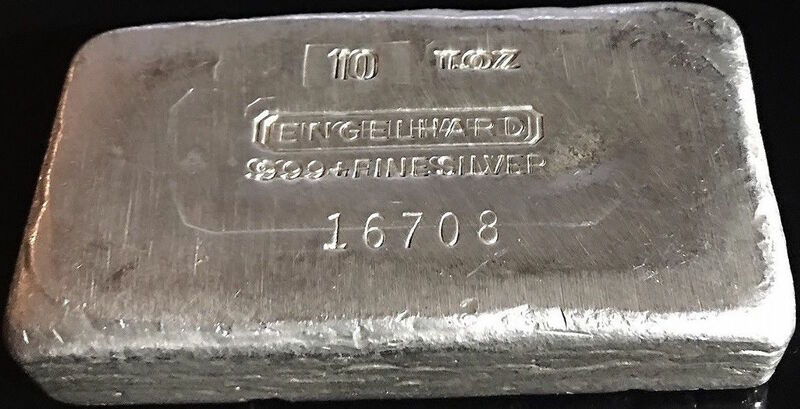 The most well-recognized of the 10oz bars are the ‘P’ prefix 7th and 10th series poured bars, produced at the Plainville, Massachusetts plant in the late 1970’s. These examples were designated ‘P’ prefix to represent the Plainville, Massachusetts facility, while examples designated ‘C’ prefix represent the Cartaret, New Jersey facility. 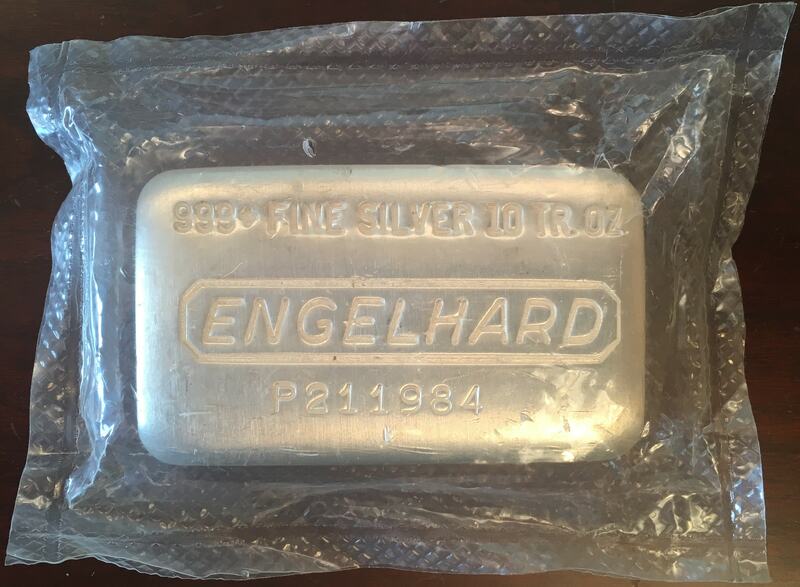 These bars, along with the later 11th series pressed bars, have been regarded as the benchmark of Engelhard investment grade bars. 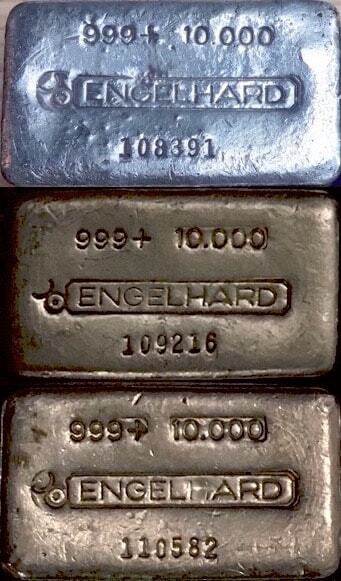 With total production of approximately 100,000 ingots combined for 7th and 10th series, and 200,000 +/- for 11th series, they were relatively common in their day. 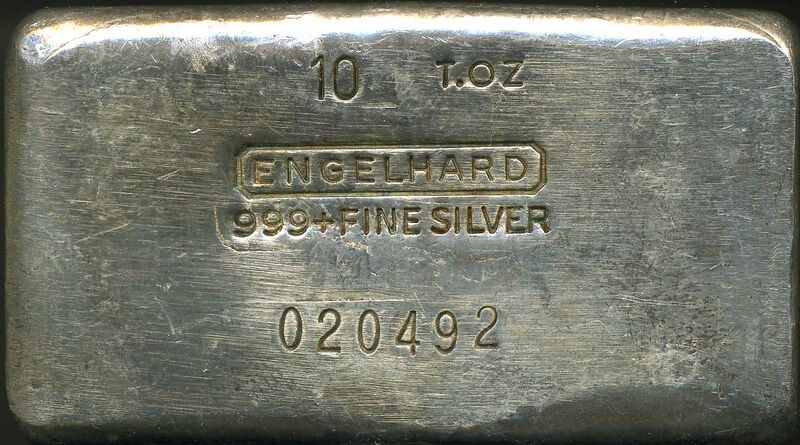 However, many have been melted over the years, further fueling the collector market’s high demand for these iconic bullion examples. 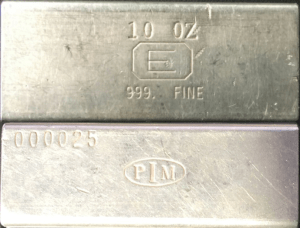 The 12th series ‘P’ and ‘C’ struck commercial bars are also gaining enthusiasm in the collector world, as the availability of earlier series bars continues to quickly diminish. Blank Canadian portrait bar in standard Maple Leaf variety, circa 1985. Example 330532 includes a Safety Award sticker on the reverse, pictured below. As such, it is very possible that at least some of these bars were produced for such purpose. Our thanks to Damien M. for this information! 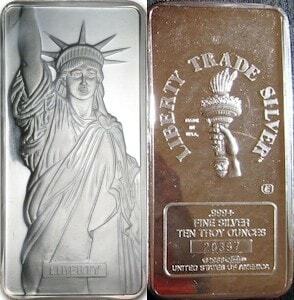 ‘E’ in Elongated Octagon [Statue of Liberty] [LIBERTY] [Statue of Liberty Torch Logo] [LIBERTY TRADE SILVER] [.999+ FINE SILVER] [TEN TROY OUNCES] [SERIAL NUMBER] [© 1986 MTB] [UNITED STATES OF AMERICA] Specialty collector bar produced for Manfra, Tordella & Brookes, 1986 mintage. 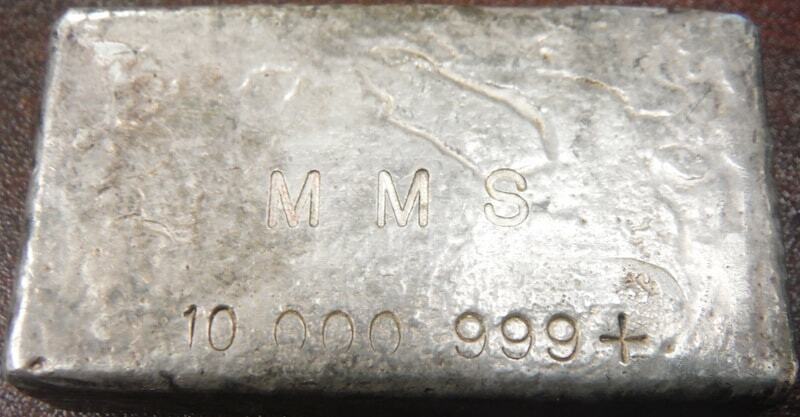 It is important to note that the Metal Arts Company [MA] produced the first 10oz bars for MTB, serial range 1 to 5,000. JM produced them in wide and narrow formats. 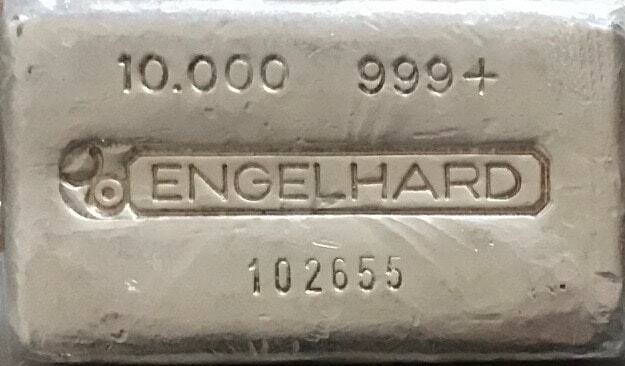 All Engelhard estimates serial range 6,500 to 16,000 and there appears to be a 1,500 serial number gap between MA, JM and Engelhard production runs. 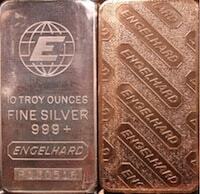 Occasionally found with original assay certificate, which typically demands a higher valuation when present. 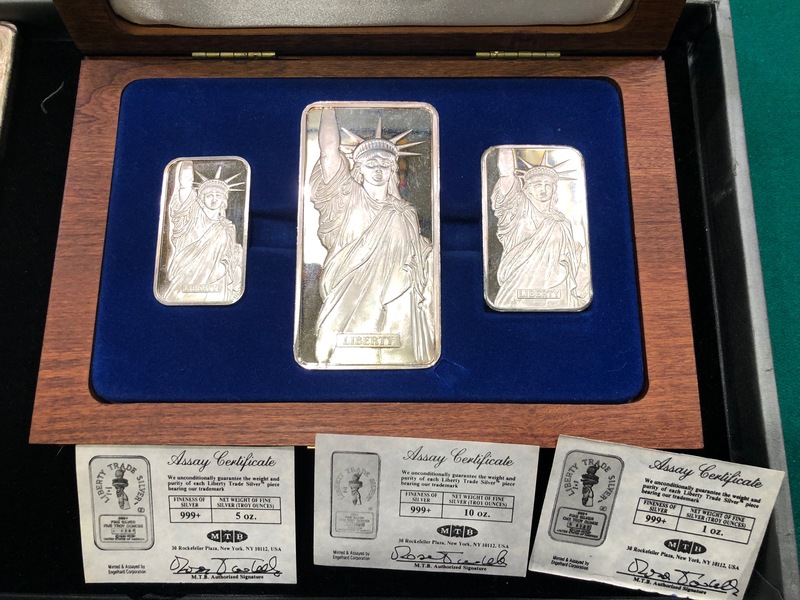 Some bars were included in a 1oz, 5oz & 10oz boxed commemorative set with estimated mintage of 1,000 total sets, pictured below. 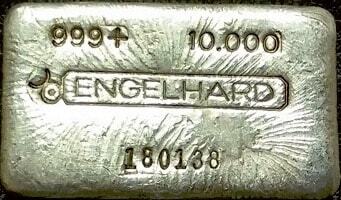 Cast Finish 2nd series in 5-digit serial and stamp placement variations. 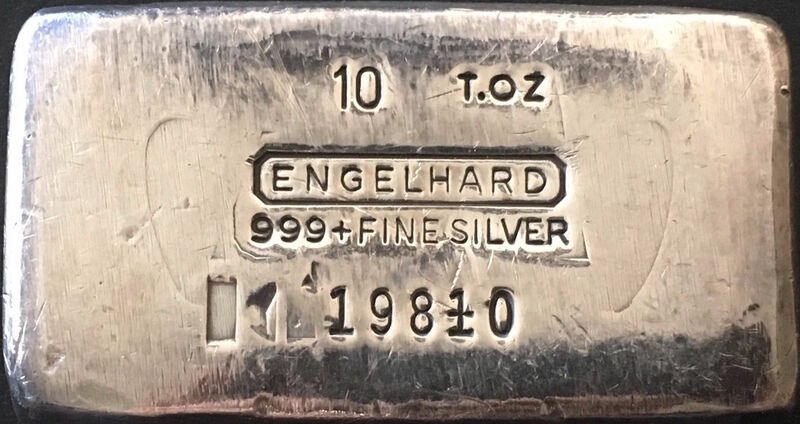 This particular example was acquired directly form the daughter of a former Engelhard executive who served on the board of directors at the New Jersey Engelhard facility. 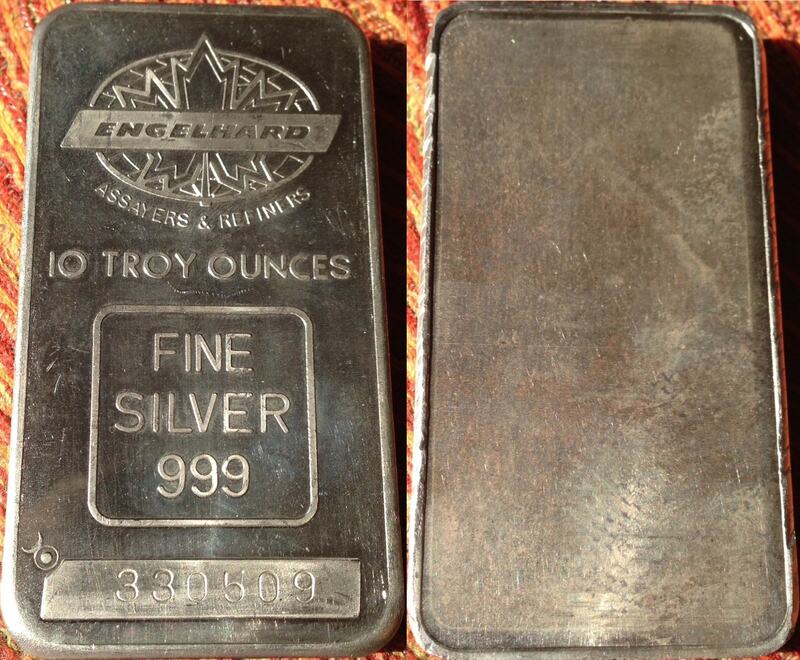 Reportedly, these bars were produced in very limited quantity as gifts for the board of directors. 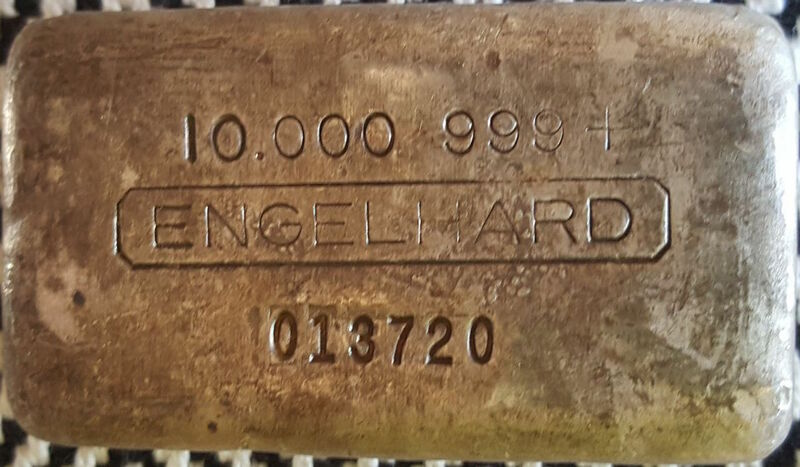 Ingot 10059 sold via eBay auction on April 6, 2018 for $2,956.00. 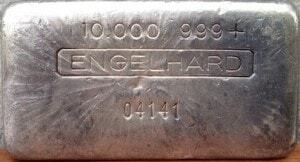 Cast Finish 3rd series in 4-digit serial variation, occasionally seen with higher placement of weight class and purity stampings. 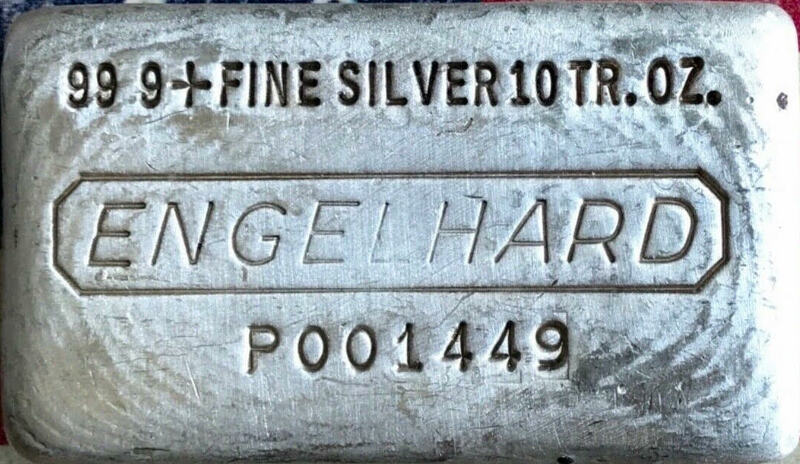 Ingot 3530 sold privately on May 13, 2017 for $2,500.00. 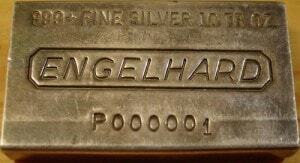 Note the variation in serial number font for number ‘3’ as demonstrated on ingot 3534, below. 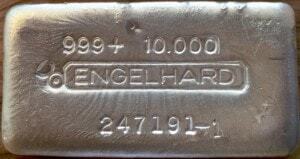 Cast Finish 3rd series in 5-digit serial variation with leading zero format. 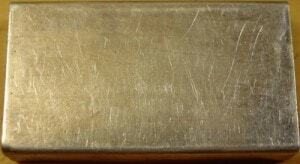 These zero  prefix bars are believed to have been produced in 1971, or prior. Please note sample serial numbers listed in the right column do not represent the only known examples. We have record of considerably more surviving examples. 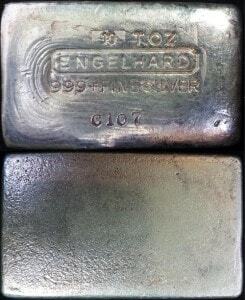 Cast Finish 3rd series in 5-digit serial variation, occasionally seen with smooth, reflective finish as observed on the 71297 ingot pictured. 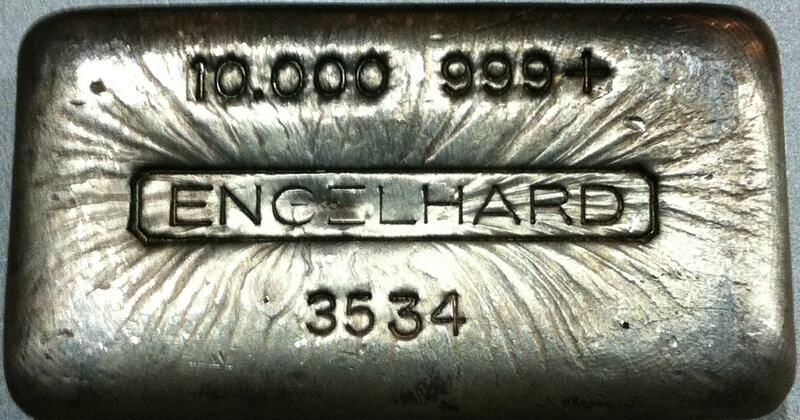 Many studied examples across serial number range demonstrate small variations of font die and casting shape. 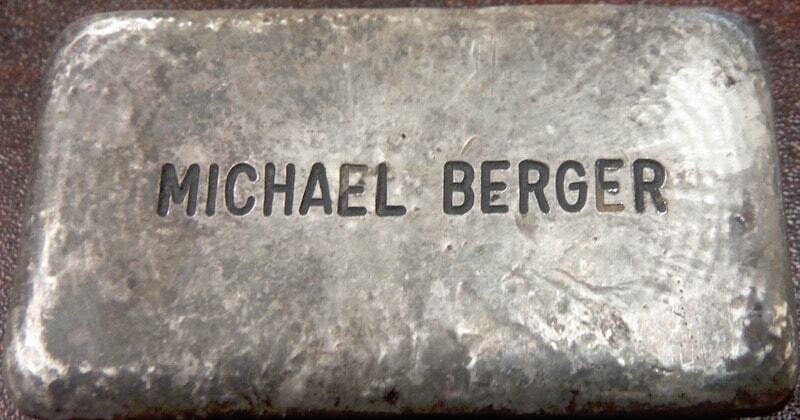 We believe the wider spacing on weight and purity stampings began around 75xxx. 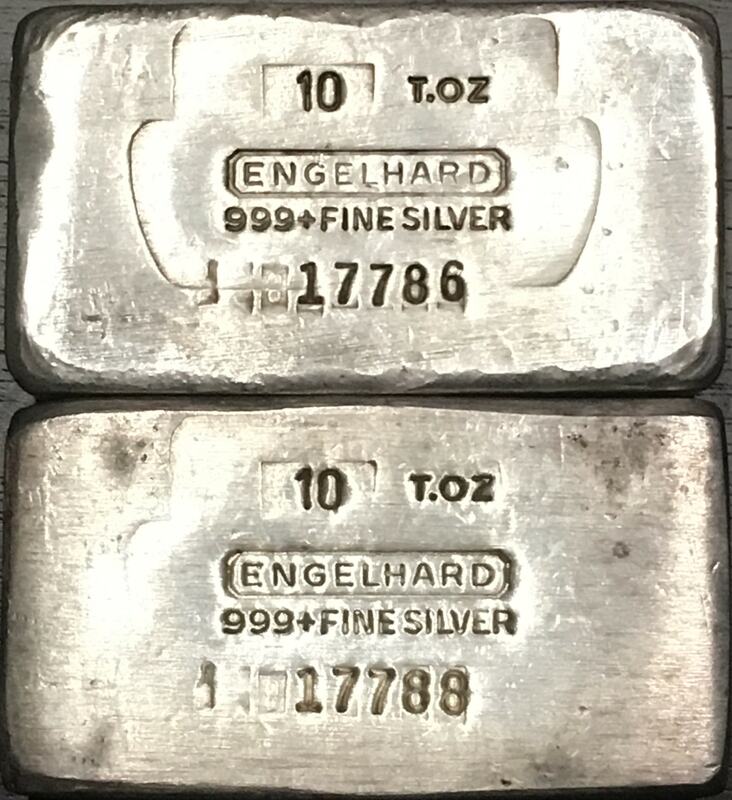 Despite the seemingly wide serial number range, we believe these 5-digit ingots were only produced randomly in small runs and are, in fact, quite rare. 3rd series in 6-digit serial variation with a number ‘8’ leading prefix. 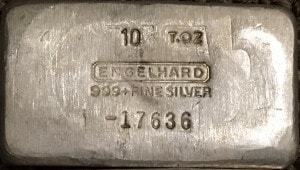 This variety demonstrates a ‘^’ over-stamp to the left of serial number. 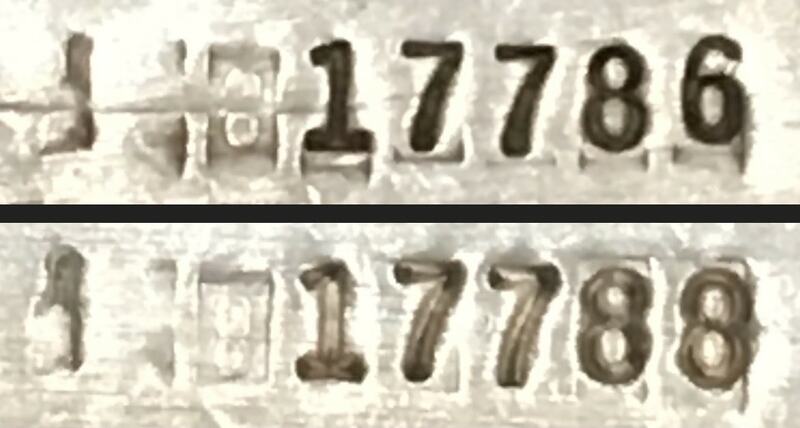 The serial number errors on these pieces resulted from part of the letter ‘X’ that was used as a filler for the lead position on the rotary stamp. 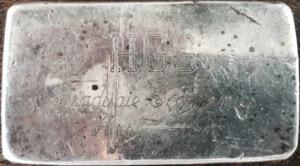 This leading filler ‘X’ slipped out of position just enough to leave an impression of the bottom or top half of the letter. 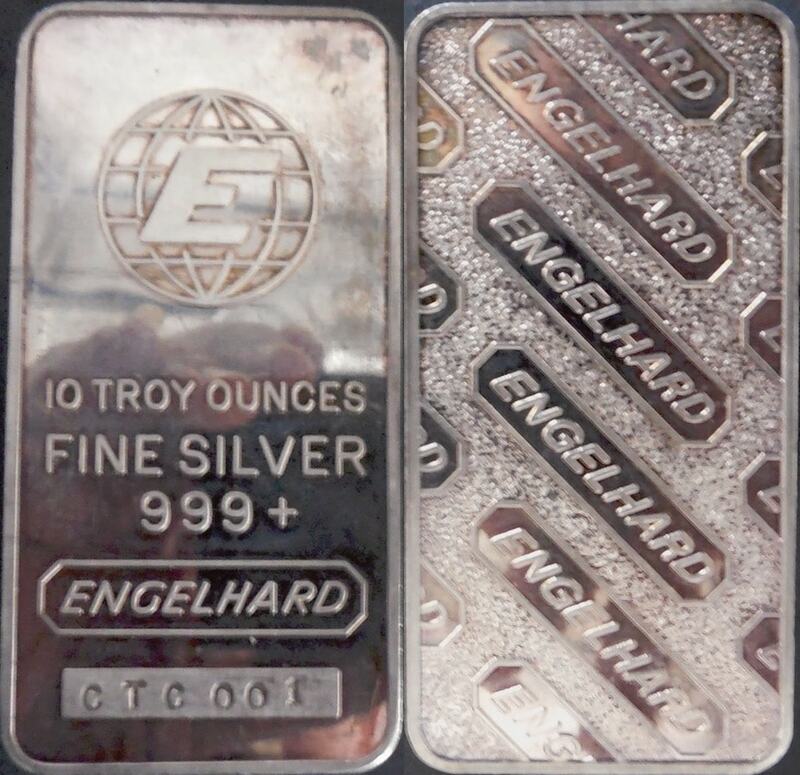 The bottom picture, bar 11948, demonstrates the bottom half of the same ‘8’ that was stamped on previous pieces had slipped back into the same position as the leading ‘X’ number to its left. Also note the strength of the impression left by leading number ‘8’ due to its lack of use. 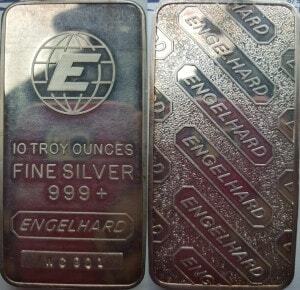 We have registry entries noted for these error pieces in very tight ranges between 811855 to ‘8’14487 to include the unique ‘Y’ prefix variety such as ‘Y’12590 and believe that this range was shared with the 100oz examples with zero prefix. 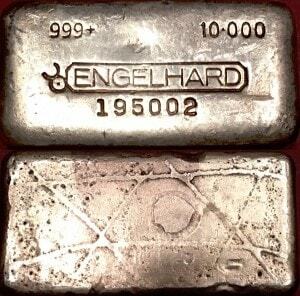 We estimate partial ‘X’ ‘8’ error stamp variety mintage at <250. 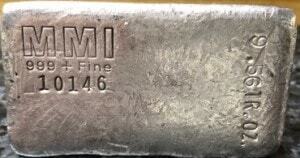 Ingot 811864 sold privately on February 20, 2017 for $1,200.00. Tulasi LoPriore’s example 13436, presented below, demonstrates the lack of serial prefix digit ‘8’ and includes the unique double ‘X’ impression. 3rd series in 6-digit serial variation with a letter ‘X’ and number ‘8’ leading prefix. 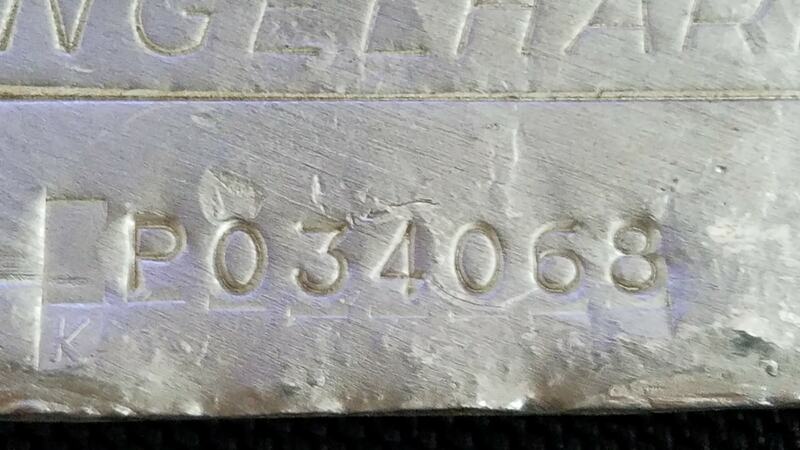 The serial number error on this piece resulted from the letter ‘X’ that was used as a filler for the lead position on the rotary stamp as well as the slipping of the number ‘8’ lead. One example, illustrated, that includes a full and perfectly struck error ‘X’ and ‘8’ serial prefix. 3rd series in 6-digit serial variation with a letter ‘Y’ leading prefix. 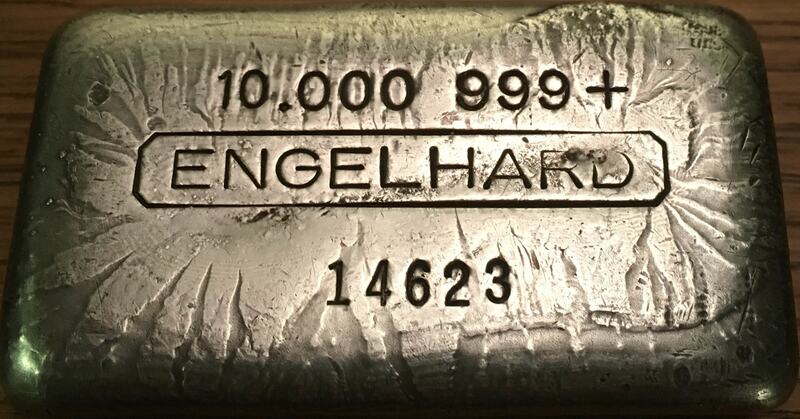 The serial number error on this piece resulted from the letter ‘Y’ that was used as a filler for the lead position on the rotary stamp. One example, illustrated, that includes a full and perfectly struck error ‘Y’ serial prefix. 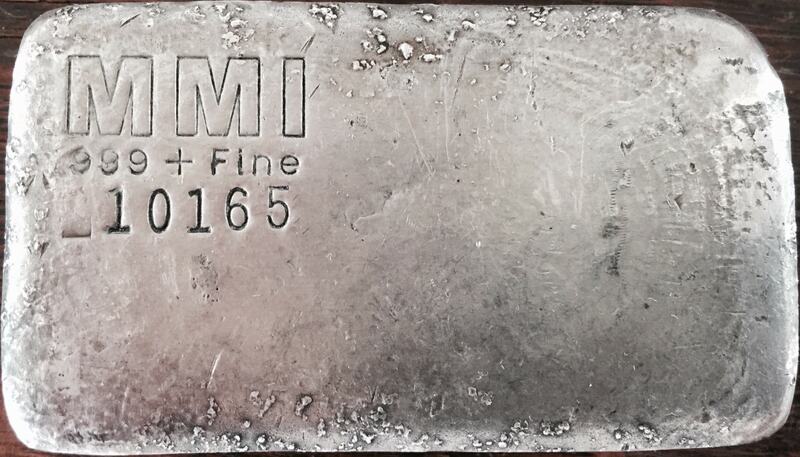 Cast Finish 5th series in standard production 5-digit serial variation with an inverted 8 serial prefix anomaly ddd. 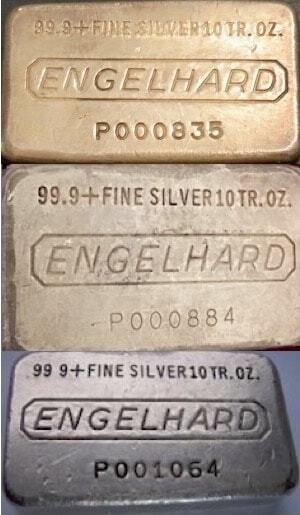 Interesting to note these ingots almost immediately follow the serial progression of the above ‘-‘ prefix bars, indicating the progression of rotary stamp issues. 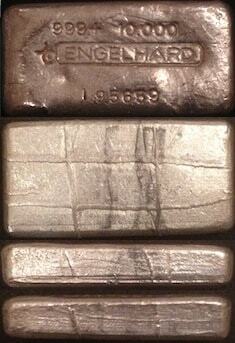 Cast Finish 6th series in series in ‘P’ serial prefix and SilverTowne counterstamp variation. 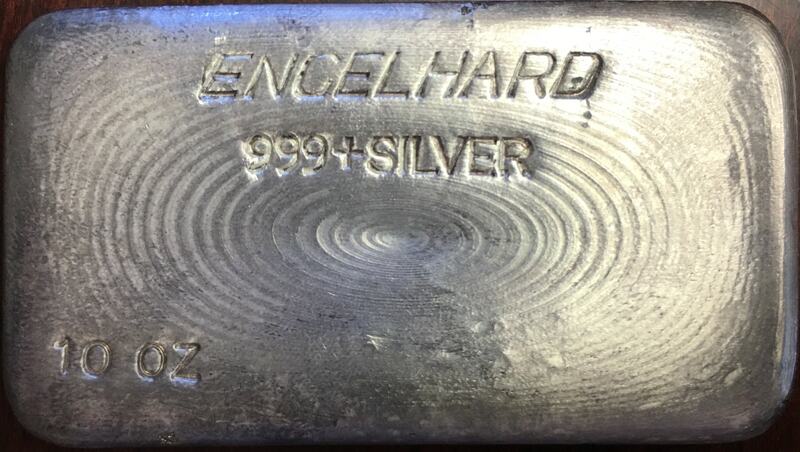 In-hand study confirms earlier numbers in this variation have casting match to its ‘Engelhard’ 5th series ingot with flat top, while later numbers have pillow top appearance. Between serial P000800 and P001410 the obverse stamping method changed, most noticeably in the rotary stamp application, as demonstrated in the photos. 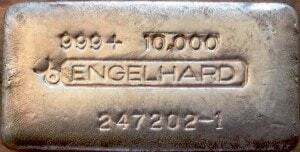 Estimated serial number range P000001 to P001499 shared with Engelhard 5th and 6th series. P000045 sold privately on February 20, 2017 for $2,600.00. P000800 sold privately on March 15, 2017 for $2,500.00. P001065 sold via eBay auction for $2,358.00 on October 21, 2017. 7th series in ‘P’ serial prefix variation, these examples have an obverse and reverse with approximately the same surface area. There are two variations of purity designation in this series. They include approximate serial range P000700 – P000900, which demonstrates a decimal in ’99.9+’. Approximate range P000900 – P001150 demonstrates a space in ’99 9+’. Current estimate is <150 of each variation. 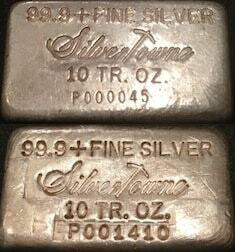 The above serial runs are shared with 6th series ‘P’ SilverTowne ingots, shown above. P001324 sold via eBay auction for $1,035.01 and P000948 sold via eBay auction for $995.01 on December 10, 2017. Waffle Back Cast Finish started around P010000 7th series in ‘P’ serial prefix variation, these examples demonstrate tapered leading edges [side slanting inward from top to bottom] so that the top has more surface area than the bottom. Note the space in ’99 9+’ purity designation. 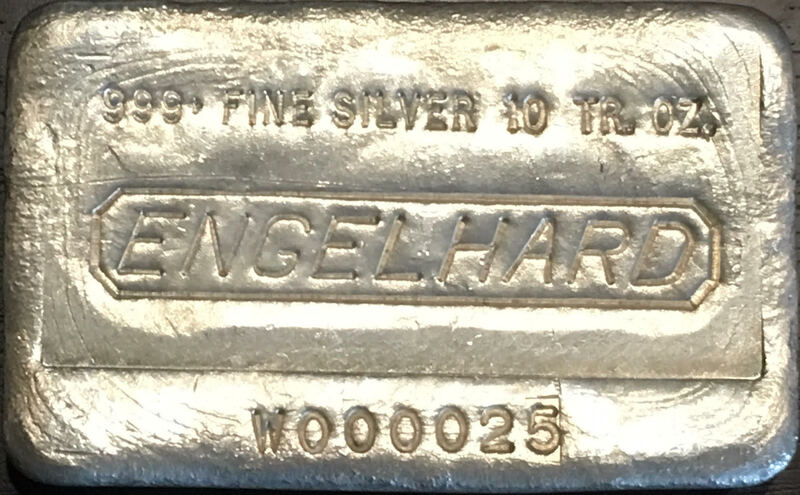 Some early 10th series bars were assigned serial numbers within the high serial range of 7th series during production transition, such as P076324. We believe complete transition from 7th series to standard production 10th series occurred close to serial number P076654. 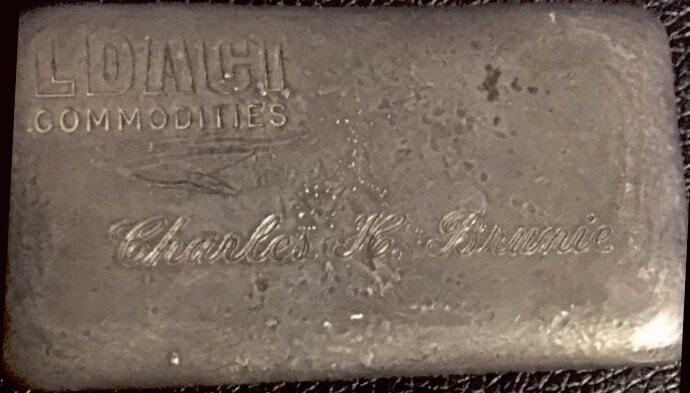 Note the bottom photo shows this variety with a letter ‘K’ below the blank serial prefix stamp. While the Waffle Back pattern was common on these production pieces after serial assignment P010000, it is important to note that there are production anomalies on these examples due to backfilling of serial number assignment. 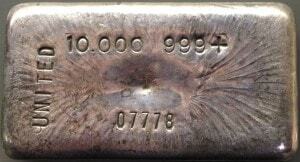 As such, it is not uncommon for a regular cast finish reverse to be observed on an ingot in serial range beyond the approximate estimated staring point of P010000. 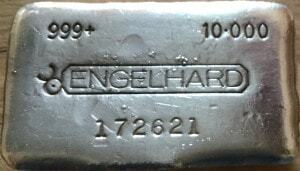 Cast Finish 9th series in ‘W’ serial prefix variation, produced exclusively at the ‘Engelhard West’ recycling facility operated in Anaheim, California in operation from 1979-2000. 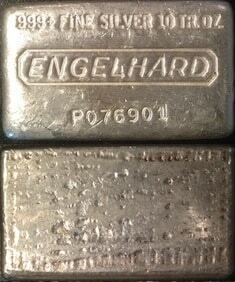 It is possible that production timeframe overlapped on both ‘W’ and ‘P’ series ingots. 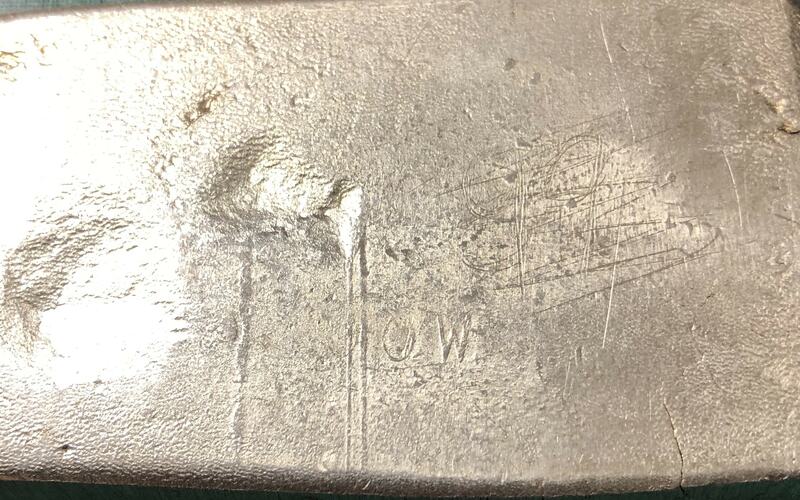 NOTE: Between W009073 – W009651 the production process changed from grinding excess weight from edges to removing from obverse. 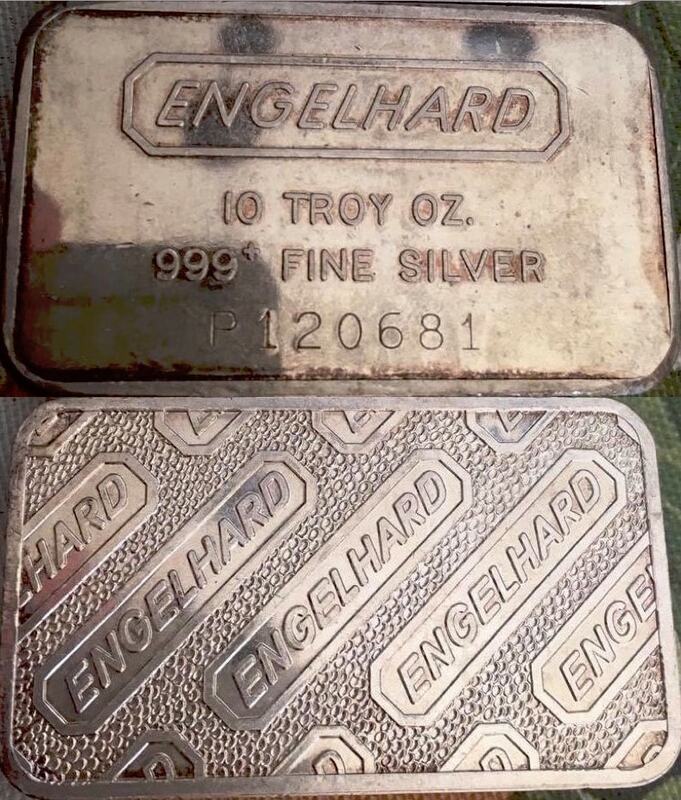 We believe this practice was exclusive to the Anaheim recycling facility and have included photos of an early and later production example for comparison as well as two ingots close to this production transition. 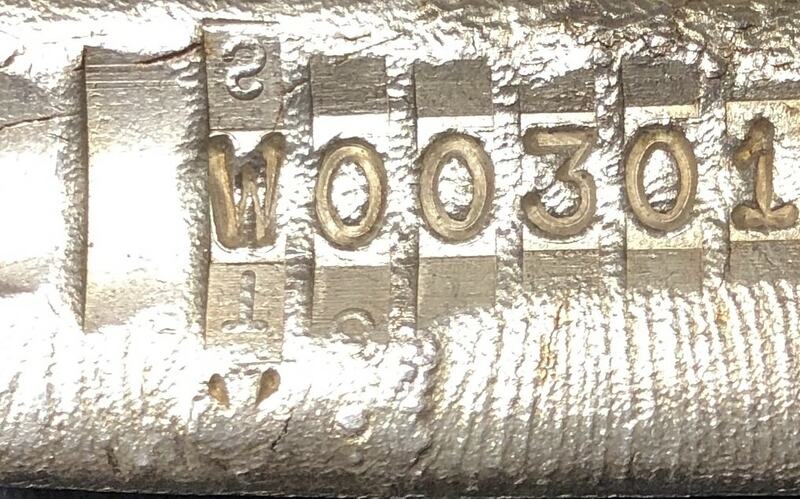 Estimated serial number range W000001 to W017999. It is interesting to note the early production examples of this variety are of a wider casting mould, as demonstrated in the photo below. 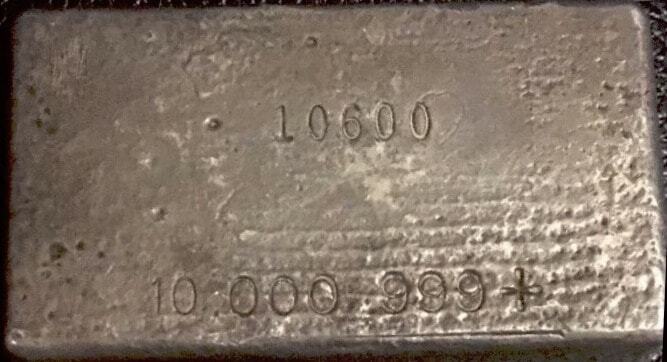 It appears that this unique casting mould was limited to perhaps the first 75 ingots produced, spanning from serial number W000001 through approximately W000075. 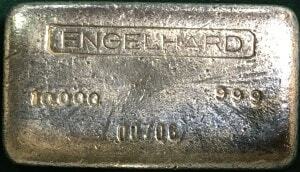 Ingot W000066 sold via eBay auction for $1,195.00 on January 19, 2019. 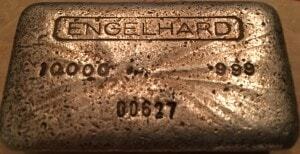 Ingot W000085 sold privately for $1,200.00 on June 12, 2018. Cast Finish 9th series in ‘W’ serial prefix variation, produced exclusively at the ‘Engelhard West’ recycling facility operated in Anaheim, California in operation from 1979-2000. 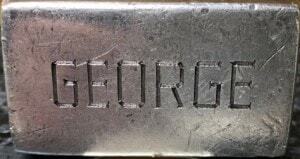 Similar to our example above, though demonstrates a unique serial blank over-stamping which reveals additional characters present on the rotary stamp dial, as pictured below. 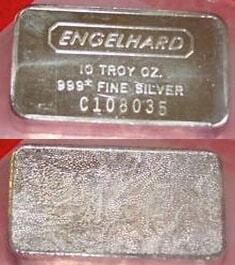 This unique ingot also demonstrates a reverse impression, also pictured. 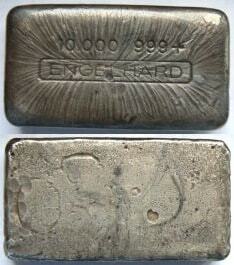 10th series in ‘P’ serial prefix variation, last variety in truly old-poured form. Note the reverse of these examples occasionally demonstrate a ‘reverse’ convex stamping impression of the top line found on the observe. 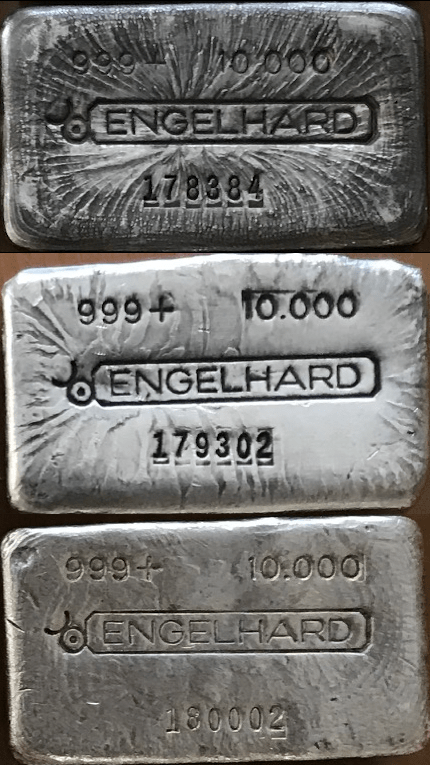 We have included multiple photos to demonstrate reverse pattern variations and believe this was caused by an inadvertent stamping of the production line surface when a bar was not present. The stamping force altered the production line surface area in such a way that the hex-screw head pattern also began leaving an impression. 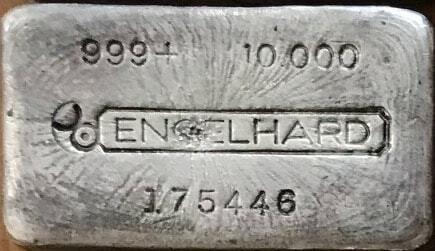 Some early 10th series bars were assigned serial numbers within the high serial range of 7th series during production transition, such as P076324. We believe complete transition from 7th series to standard production 10th series occurred close to serial number P076654. 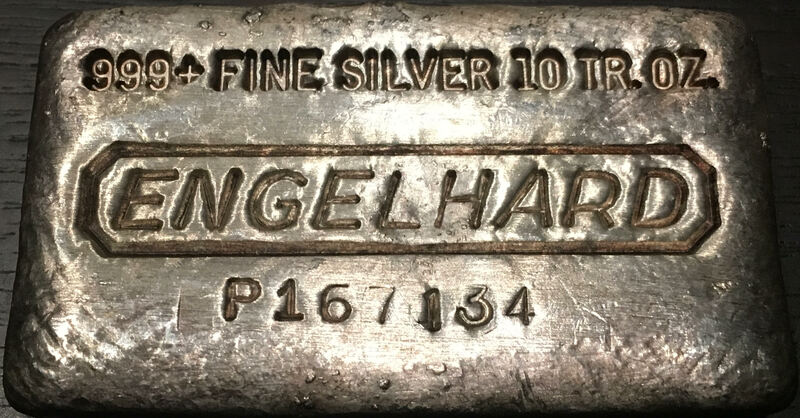 This ‘P’ prefix serial run was also more commonly shared with 11th and 12th series 10oz ‘P’ class, 8th series 100oz extruded class and 1st series portrait ‘Tall E’ extruded class. 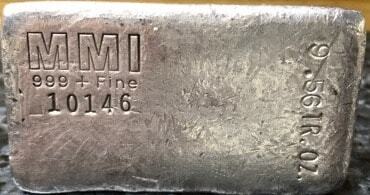 Note the double-stamped second number ‘1’ in the photo below of ingot P167134. 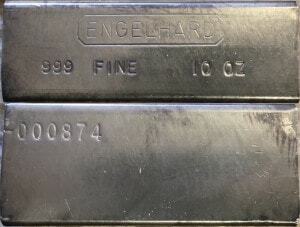 10th series extruded bar produced by Engelhard for Colonial Refining, Inc. On May 23, 2017 both known examples sold. 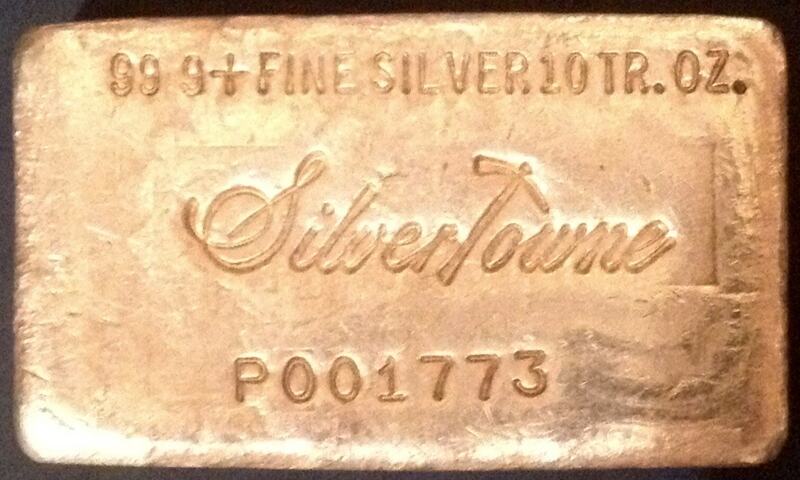 P001445 sold on eBay auction for $2,365.00 and P001177 sold privately for $2,500.00. 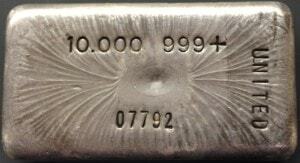 11th series prototype bar. 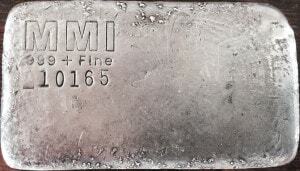 Measures 66.29mm x 38.10mm x 12.19mm. 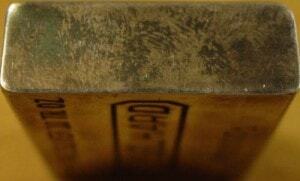 Obverse surface area measures 36.83mm due to variances in leading edge angles. 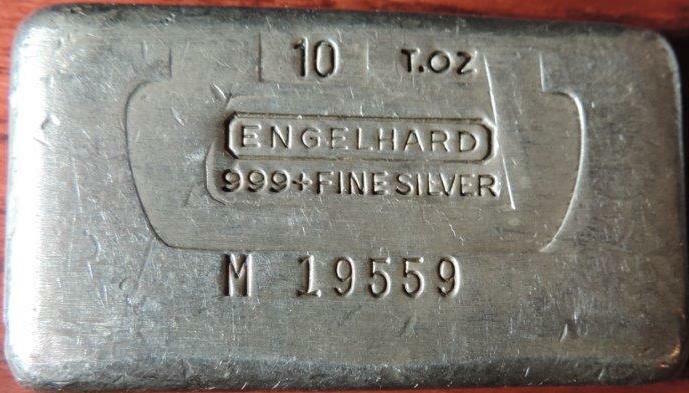 Based on production method and shape of this bar, we believe it also possible this is a prototype bar of the 10oz industrial E bar, defined below. Thanks to S.S. for the pictures! 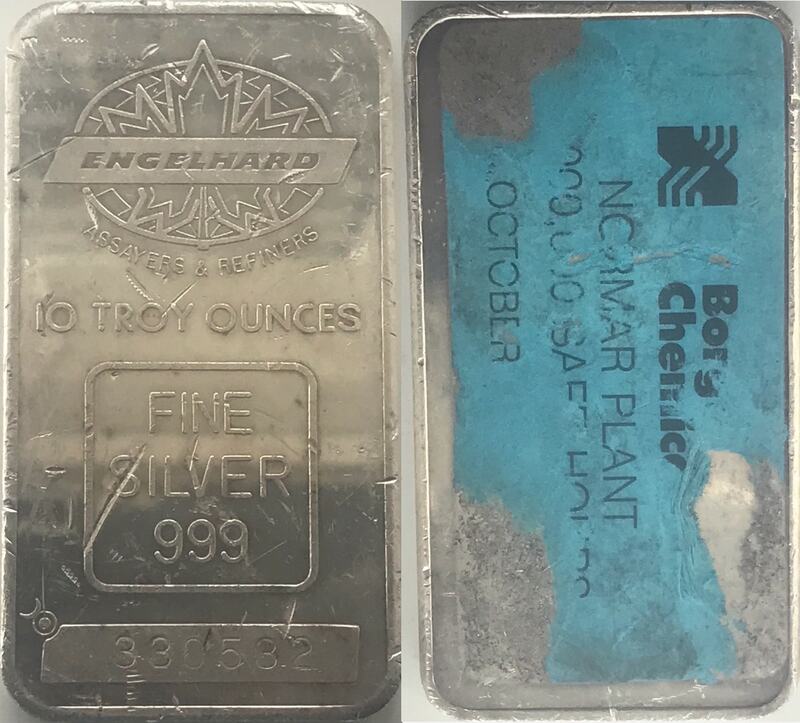 Bar P000001 sold privately on September 18, 2015 for $5,500.00. 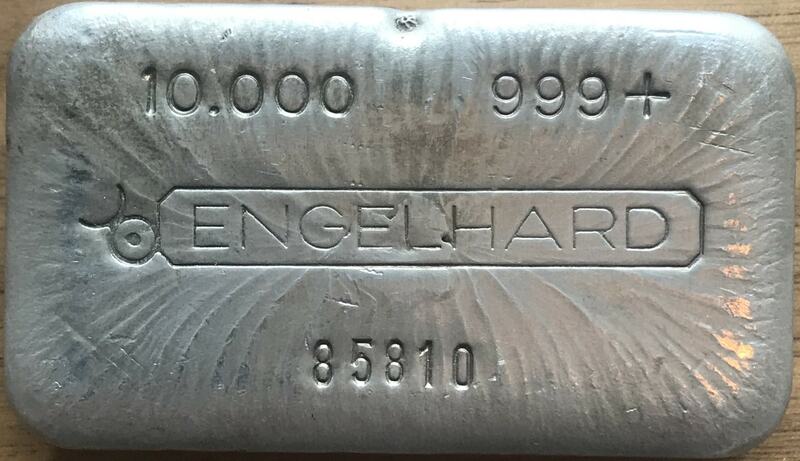 Flat Machined Finish 11th series example that Engelhard employees could commission to be made with their initials incorporated into the serial number. 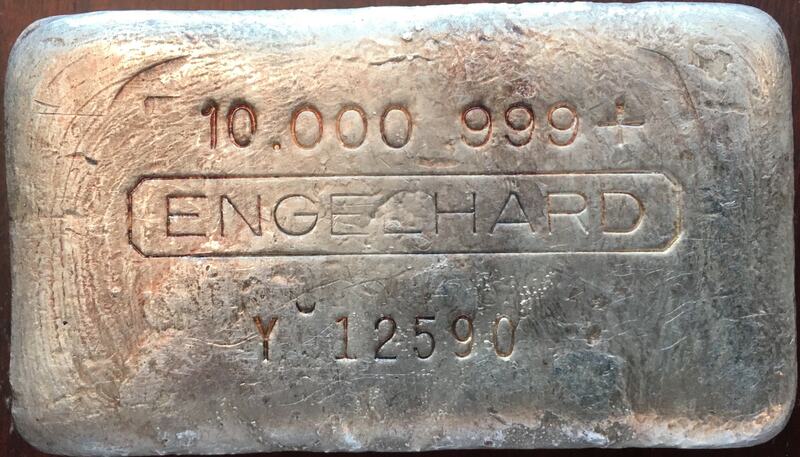 Bar IDI 001 was sold via eBay private sale for $2,000.00 on August 29, 2015. 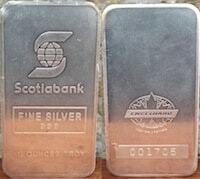 These bars were originally produced with a brilliant reflective finish. Flat Machined Finish 11th series in ‘P’ serial prefix variation, one seller stated that they bought their bar in 1983 [P299370]. Note the reverse of these examples occasionally demonstrate a ‘reverse’ convex stamping impression of the top line found on the observe. 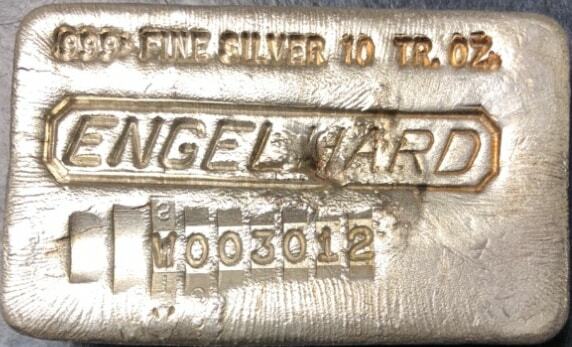 We believe this was caused by an inadvertent stamping of the production line surface when a bar was not present. The stamping force altered the production line surface area in such a way that the hex-screw head pattern also began leaving an impression. 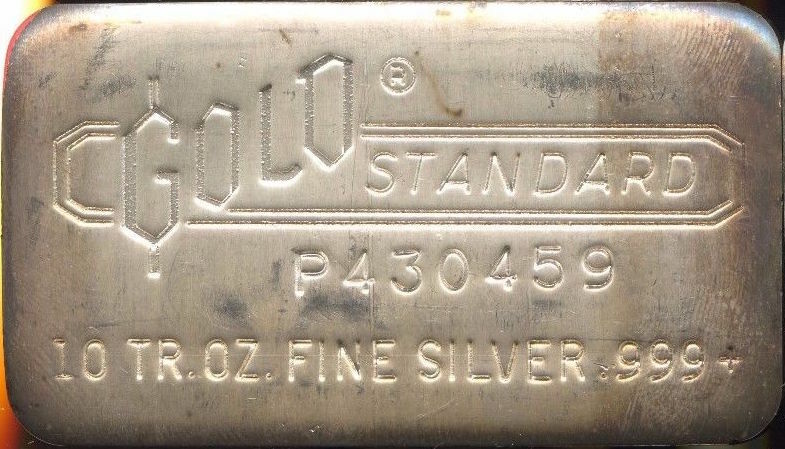 Evidence suggests this span was shared with 100oz ‘W’ bars and later ‘P’ bars that were within the +/- P090000 – P430000 range. Some examples issued in plastic protective cover, pictured below and very rarely seen. 11th series in ‘P’ serial prefix variation, similar to our example above except in serial absent format. 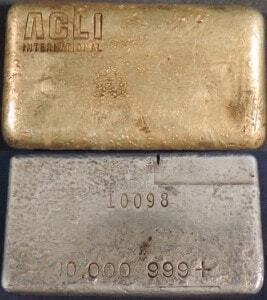 11th series ‘P’ serial prefix in Gold Standard counterstamped variation. Despite relatively high estimated mintage, these are rarely seen. 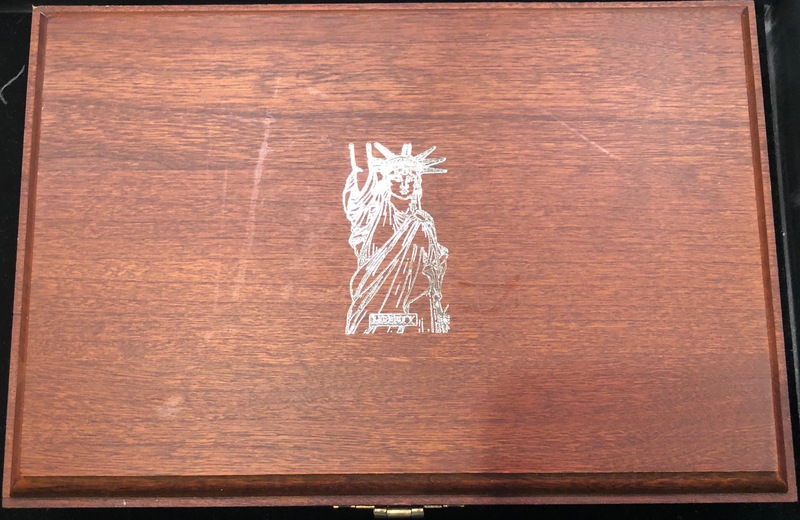 Additional details regarding the Gold Standard counterstamp may be found at this LINK. 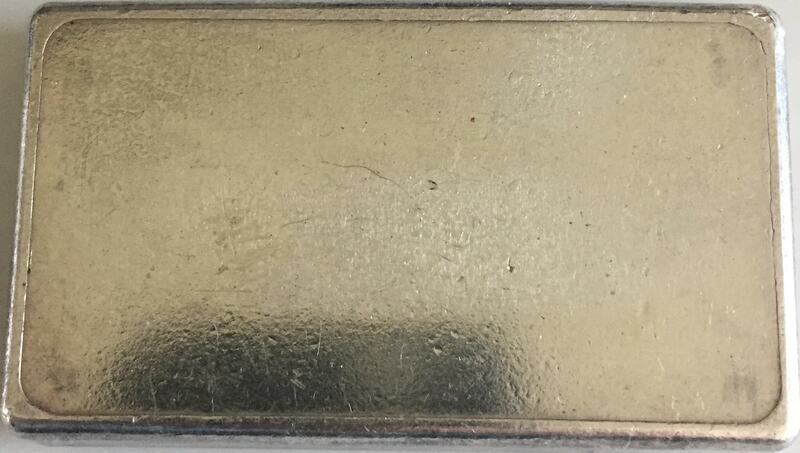 11th series ‘P’ serial prefix in Gold Standard counterstamped variation. 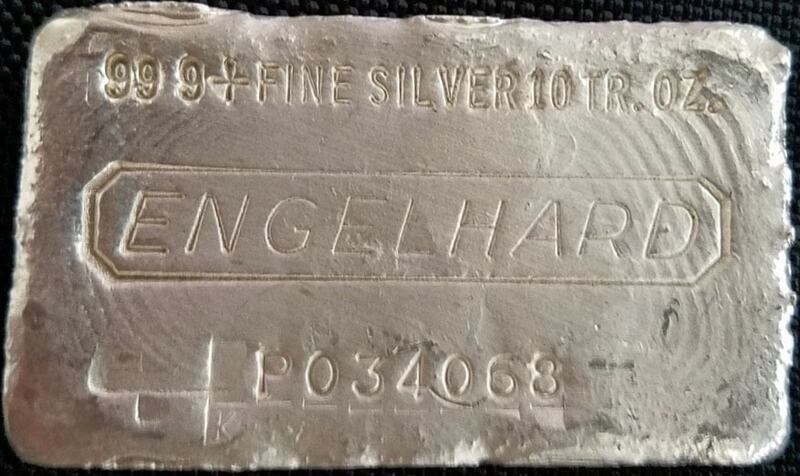 Similar to our example above, though demonstrates reverse placement of weight and purity stampings. Despite relatively high estimated mintage, these are rarely seen. 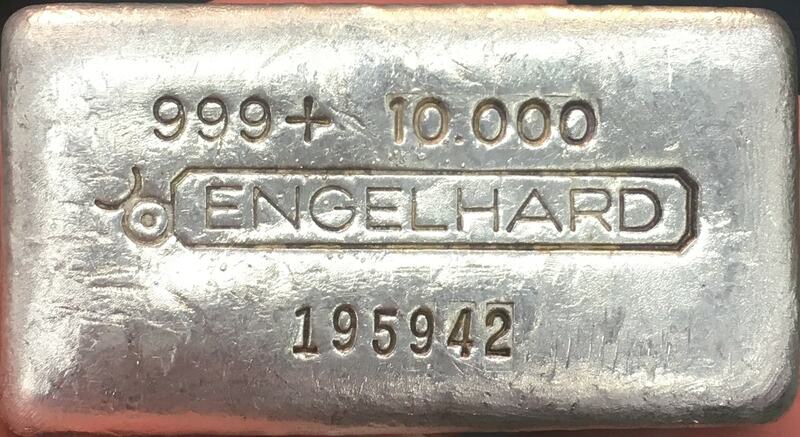 Bar P430535 sold via eBay auction on April 2, 2018 for $895.00 BIN. 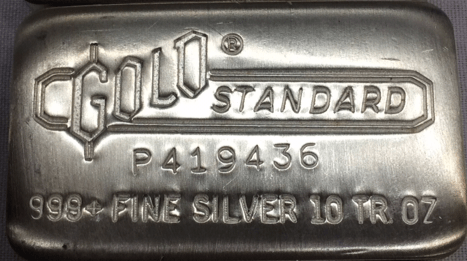 Additional details regarding the Gold Standard counterstamp may be found at this LINK. 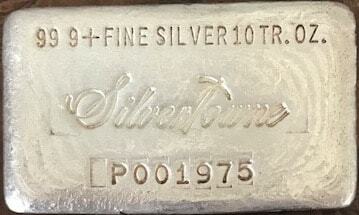 12th series Variety “A” in ‘P’ serial prefix transitional piece, last of the ‘P’ series run, less frequently seen. 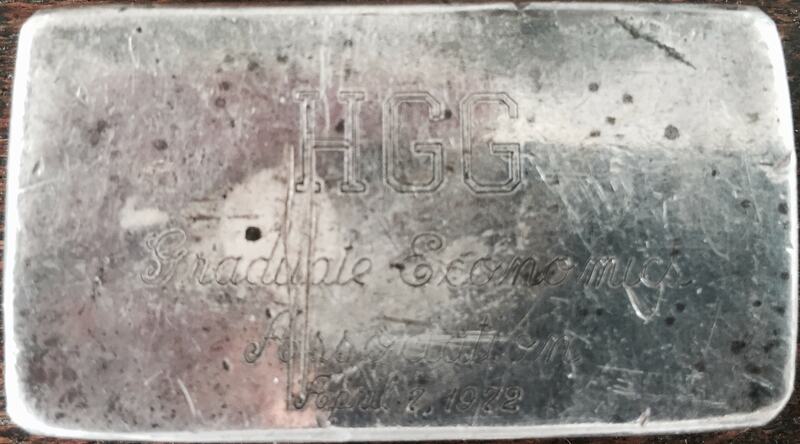 This particular example is a very rare early variety of the more commonly found example listed directly below. 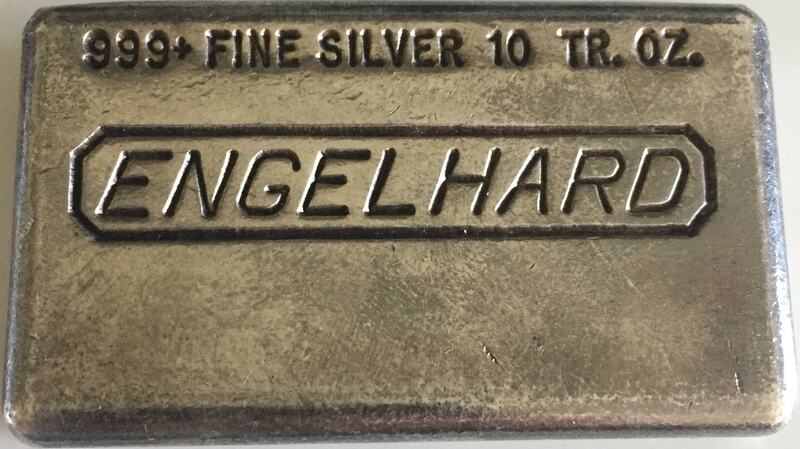 Differences include font thickness on obverse and reverse hallmark logos as well as the ‘+’ font found on ‘999+’. 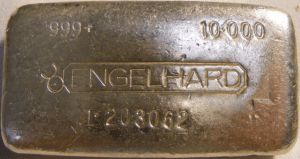 Our study of Canadian 10oz weight class pieces included several hundred examples and was conclusive enough to justify the presentation of five  series of ingots and three  series of commercial bars. Our commentary column includes general information observed on the majority of pieces studied. However, it is important to note that there were exceptions found during our studies. For example, an ingot may occasionally include a serial font specific to the United States whereas the majority of other pieces within the same series demonstrate a Canadian serial font. We do not believe that serial number assignment is necessarily indicative of production order and that there were some variations in prefix assignment across all series. 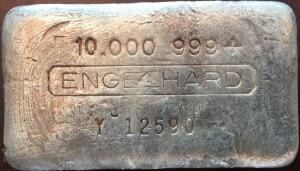 Please also note that we have occasionally observed casting mould variation on Canadian produced ingots and it is not a terribly uncommon characteristic. 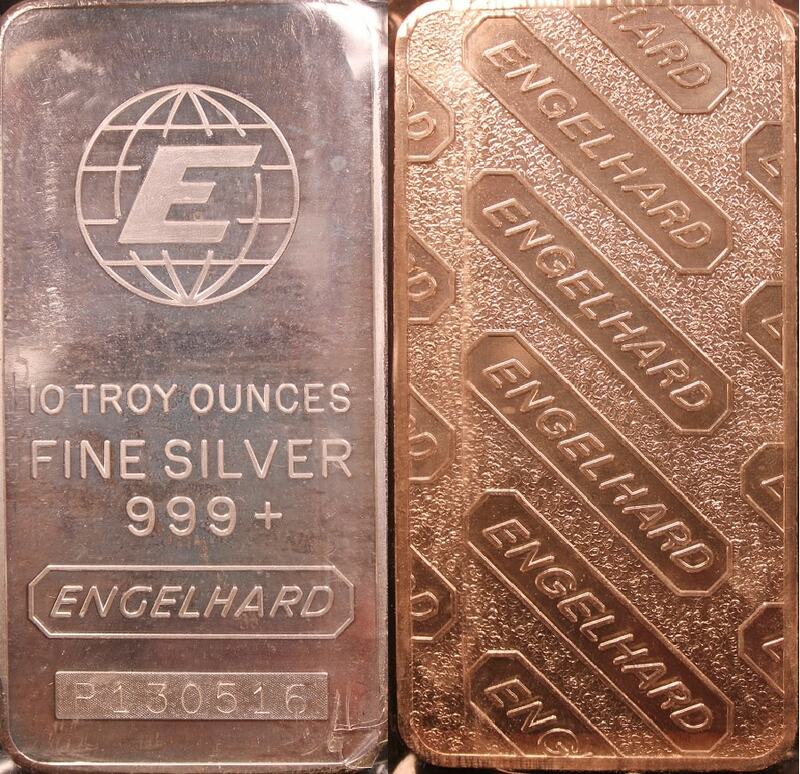 We are confident that the 2nd and 4th series ingots were produced simultaneously and stamped with two different hallmark and stamp set placements. 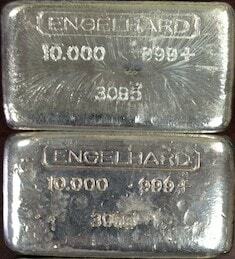 The serial numbers observed across these two series of ingots are interspersed and are indicative of simultaneous production for both variety at the same production facility. We do, however, believe that the differences observed on these two series are significant enough to warrant the assignment of separation. 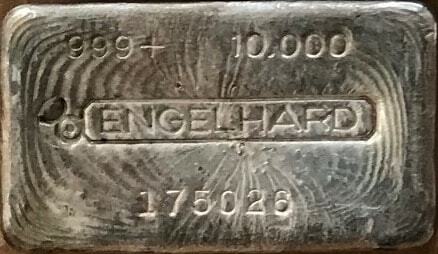 2nd series ingot in Canadian variation. 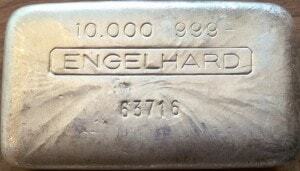 This ingot shares the same casting mould as our 1st series ingot, above. 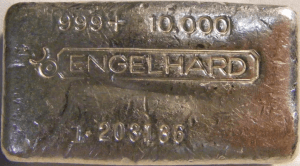 Note the reverse placement of weight and purity stampings, with 10.000 on left and 999+ to right, as well as the difference in serial font – the numbers ‘1’ and ‘3’ specifically. 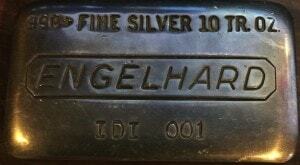 It appears that production was split about equally between the two variations of leading ‘1’ serial number fonts. These variations include the ‘I’ without a base, top photo, and ‘1’ with a base, as seen on our bottom photo. 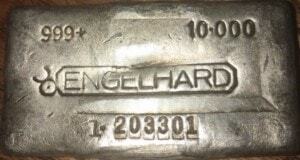 3rd series ingot in Canadian variation. 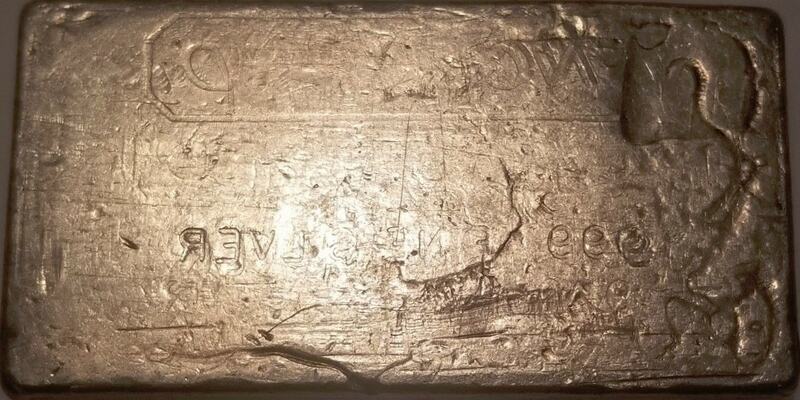 This ingot appears to share the same casting moulds as the 1st and 2nd series ingots, defined above. 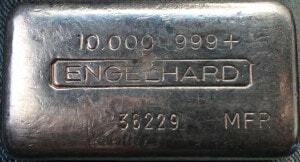 The number ‘1’ serial font is unique to this variety, and the variety directly below, in that it demonstrates a slightly angled top bar and a full horizontal bottom bar.The range of 107xxx to 110xxx serial numbers was back-filled to an available earlier run, though placement of weight and purity stampings are of new format. Our appreciation to Dan S. for this discovery! 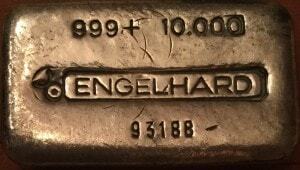 3rd series ingot in Canadian variation. Similar to our variety directly above, though the most distinguishing characteristic is wider spacing of the purity and weight class stampings. Please note there are variations in the ‘1’ serial font as demonstrated in the photo to the left, with the 175446 being the anomaly. This variety also is of a unique casting mould that resulted in side edges of this variety being more square in shape, without the tapered angle common to other 10oz Canadian examples. 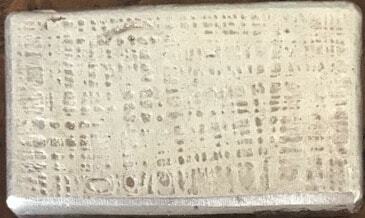 The photo below demonstrates the casting mould size variation. Our appreciation to Dan S. for this discovery! 3rd series ingot in Canadian variation. Similar to our variety directly above, though demonstrates a different serial font. 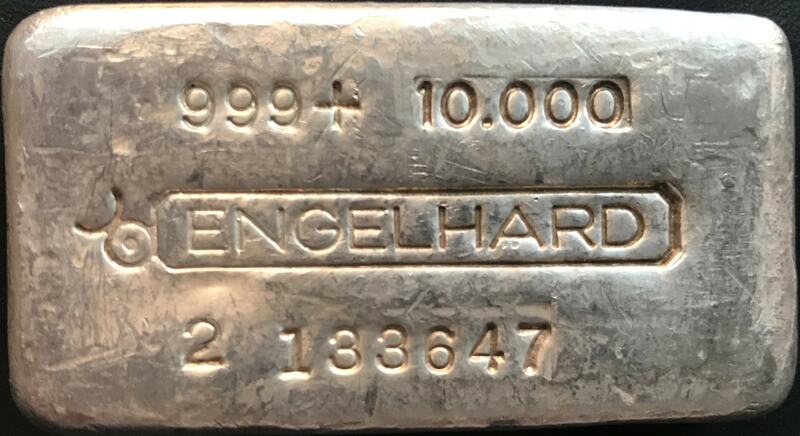 Mid Hallmark [999+] [10.000] [Bull Hallmark in Elongated Octagon] [Serial Number] Cast Finish 3rd series 10oz ingot in Canadian variation, most commonly produced series and observed with several series-specific anomalies. 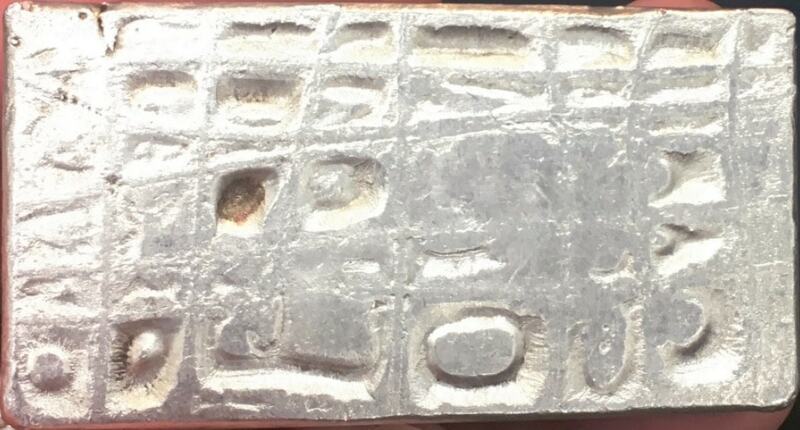 We believe theses ingots were produced using a Canadian casting mould and are occasionally seen with patterned ‘waffle’ or ‘heavy grid’ reverse, pictured below. 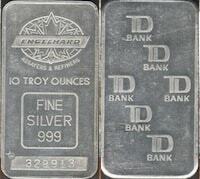 Note also that both United States and Canadian serial number fonts are commonly observed throughout serial number range. 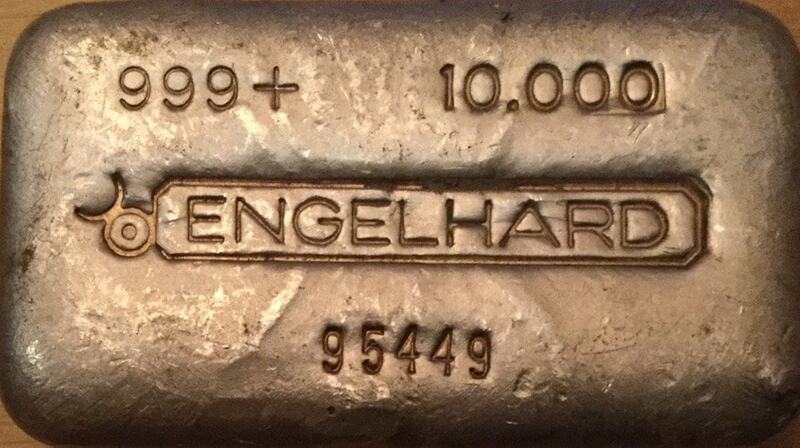 Slight differences in purity and weight class stamp placements will be noted between some examples. 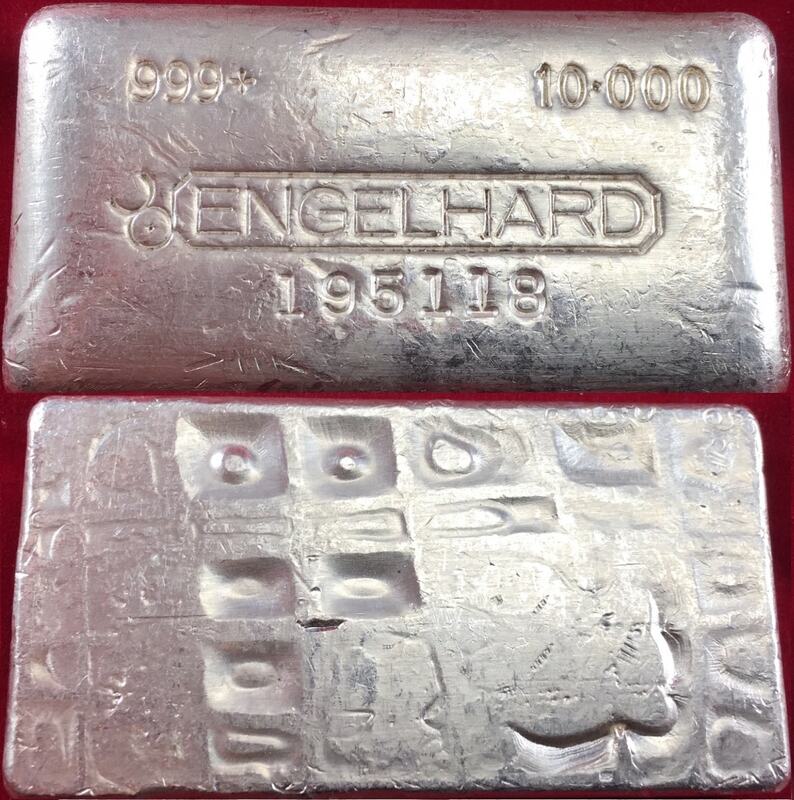 Mid Hallmark [999+] [10.000] [Bull Hallmark in Elongated Octagon] [Serial Number] Patterned Cast Finish 3rd series 10oz ingot in Canadian variation. These examples demonstrate a ‘linen’ pattern on the edges and reverse. 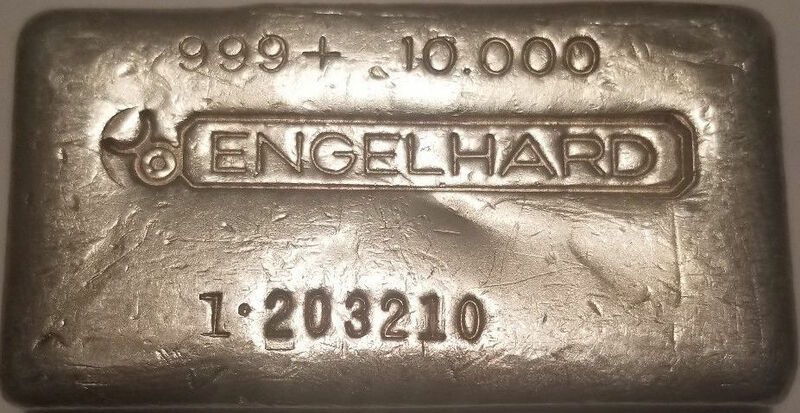 [999+] [10.000] [Bull Hallmark in Elongated Octagon] [Serial Number] Patterned Cast Finish 3rd series 10oz ingot in Canadian variation. These examples demonstrate a ‘waffle’ pattern on the edges and reverse. 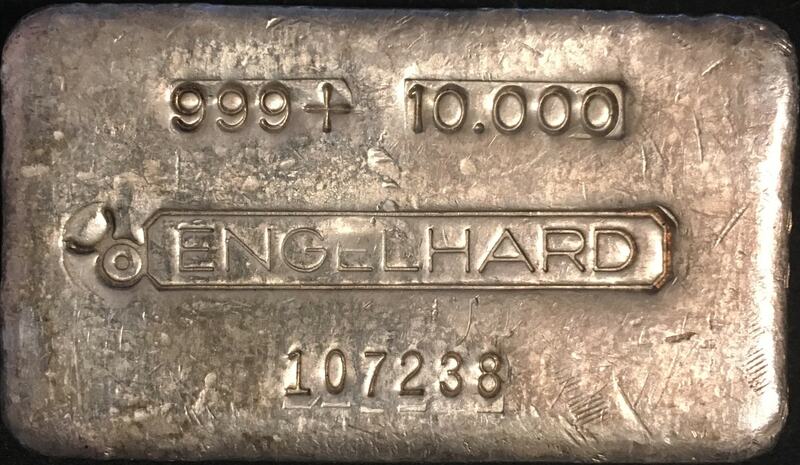 Mid Hallmark [999+] [10.000] [Bull Hallmark in Elongated Octagon] [Serial Number] Cast Finish 3rd series 10oz ingot in Canadian variation. These examples demonstrate a ‘1•’ serial prefix anomaly, observed under samples in the next column. 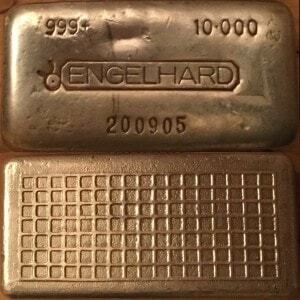 Ingot 1•203098 sold via eBay auction on September 28, 2017 for $2,007.00. 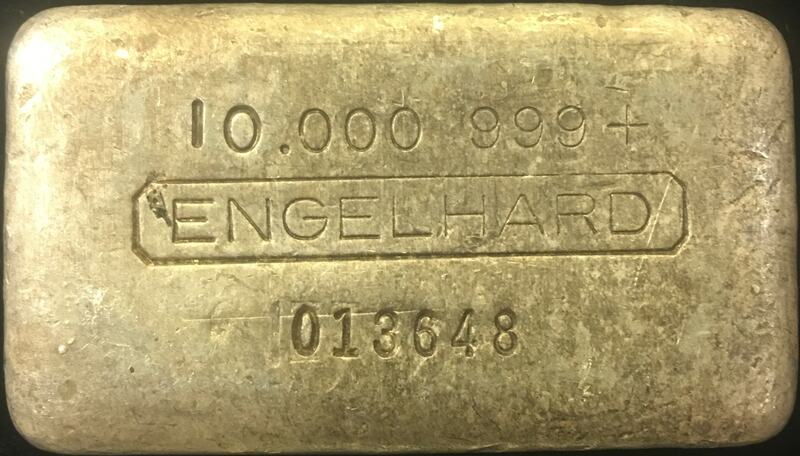 Ingot 1•203210 sold privately in June, 2017 for $1,500.00 a reverse stamping impression anomaly, pictured below. 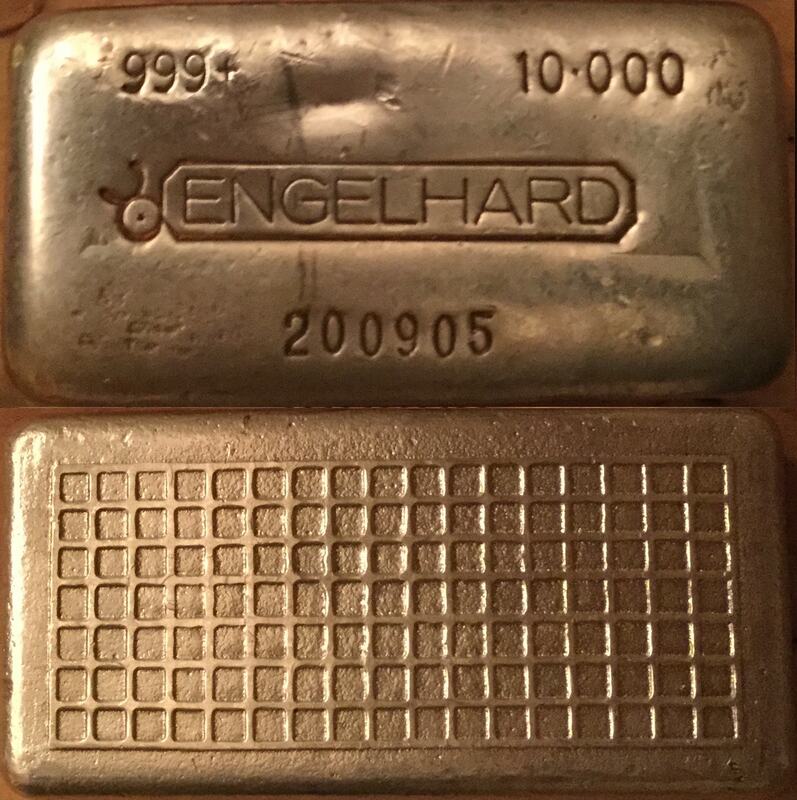 Mid Hallmark [999+] [10.000] [Bull Hallmark in Elongated Octagon] [Serial Number] Cast Finish 3rd series 10oz ingot in Canadian variation. These examples demonstrate a ‘I.’ serial prefix anomaly, observed under samples in the next column. 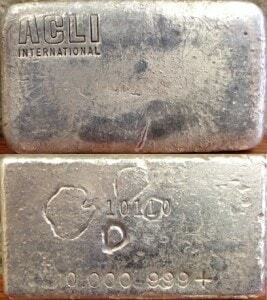 Ingot l.203291 sold privately on March 15, 2017 for $2,500.00. NOTE: Variations exist within the above classes based on stamp set spacing. NOTE: Variations exist within the above classes based on reverse finish anomalies and serial number ‘1.’ prefix and ‘-1′ suffix variations. 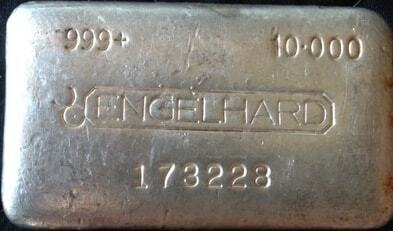 Most Engelhard 10oz class silver bars have serial numbers. Our archives indicate that the 6-digit Canadian variety serial number did not exceed 330000 [with several minor variations]. 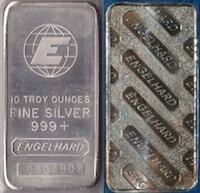 They began with poured examples and were followed by machined examples. It is possible that, in some cases, two variety were produced simultaneously. Our archives indicate that P series likely preceded W series, both of which preceded the final production C series variety. In the case of 10oz examples, only three letters of P, W and C were used and in that order. 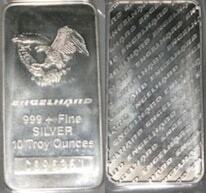 There may be duplicate serial numbers [but not of the same design] due to the Eagle/Flag logo production ‘rolling over’.